Access the 3D View Settings by using the pop-out panel on the left edge of the 3D View. Note: Click the blue arrow to show or hide the settings. View handle colour: The colour of the 3D View icon and the colour of the navigation markers. Background colour: The background colour of the 3D view window. Font size and colour: Adjust the appearance of labels in the 3D view. North arrow: Display and choose the colour of the north arrow. X/Y grid: Show and choose the colour of the X/Y coordinate grid. Survey grids: Show survey grids. Choose colours for each survey in the Survey tab (see Defining Survey Details). 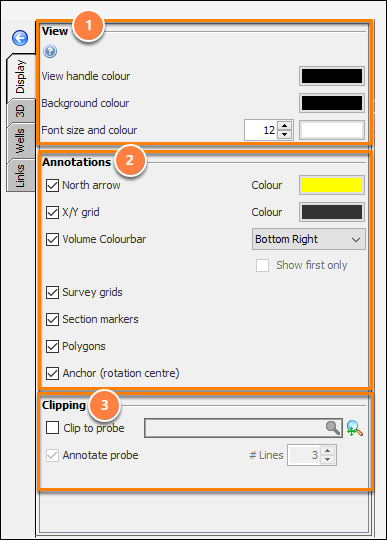 Section markers: Show markers where the inline, crossline and horizontal-slice intersect. Polygons: Show or hide polygons. This is enabled by default. Clear this setting to hide all polygons in the view. Individual polygons can be shown or hidden in the Polygon tab (see Polygon Overview). Anchor: Show the centre of rotation centre, or “Anchor”. Clip to probe: Limit the displayed data to the selected probe. 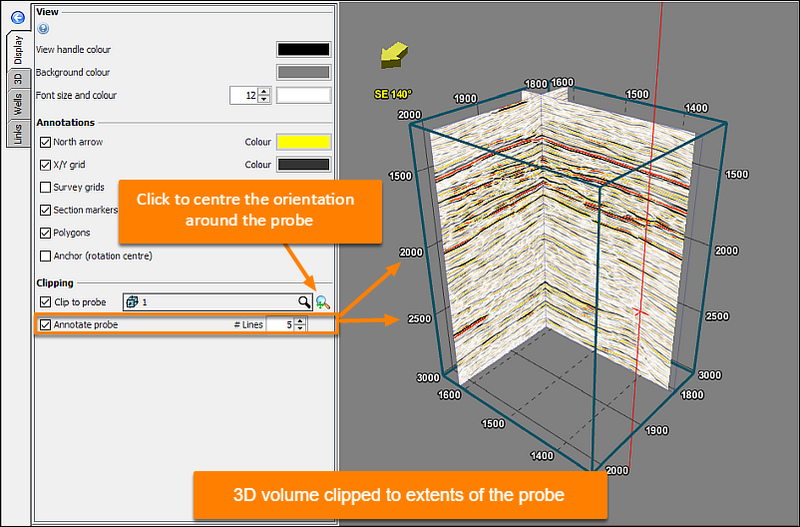 Centre to View icon: After enabling clipping, click to re-orient the 3D view around the probe. Annotate probe: Annotate the probe with coordinates to aid navigation. Z-scale: Apply a vertical stretch or squeeze to the data. Lower values squash data vertically, while larger values stretch the data. Volume Visualisation is available with the Explorationist Module. For more information, see Volume Visualisation. Style: Choose the style of the 3D crosshair - Cross, Star or Globe. Size & thickness: Choose the crosshair size and thickness. 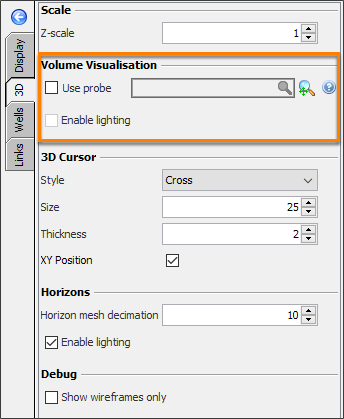 Horizon mesh decimation: Adjust the detail of horizon surfaces in 3D. Lower values result in additional detail, but requires additional memory. Increased decimation improves performance for large horizons. Decreased decimation increases the quality, but may affect performance. Note: Reduce the decimation setting if there is a disparity between the horizon and the seismic event on which it was picked. 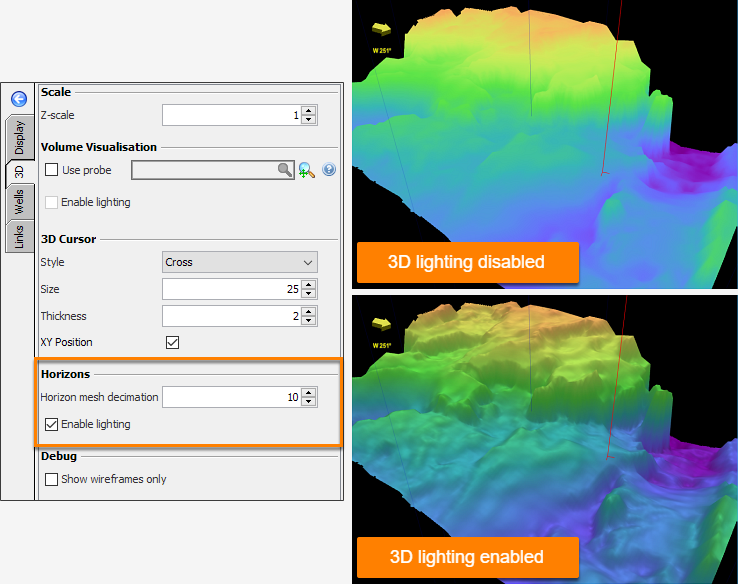 Enable lighting for horizons: Apply lighting / shading to surfaces in the 3D View. Lighting and shading can affect the performance. If navigation is slow, try disabling this option. Show wells: Show or hide wells. Clear this setting to hide all wells in the view. 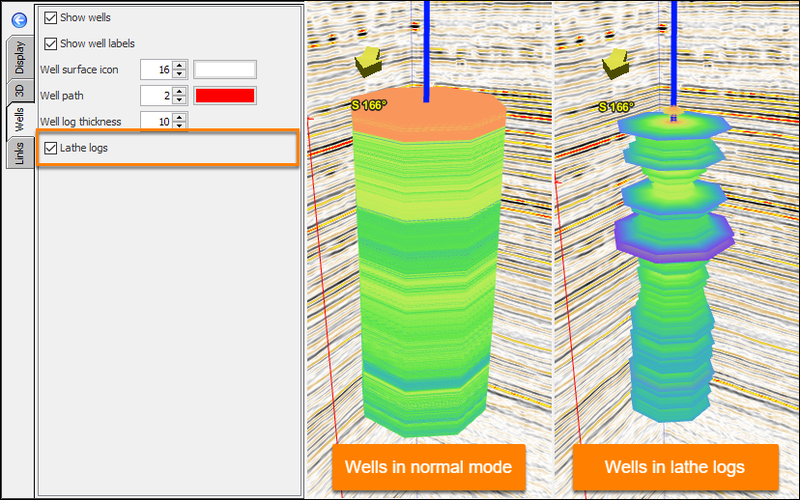 Individual wells can be shown or hidden in the Wells tab. Show Well Labels: Show annotations for well names and markers. 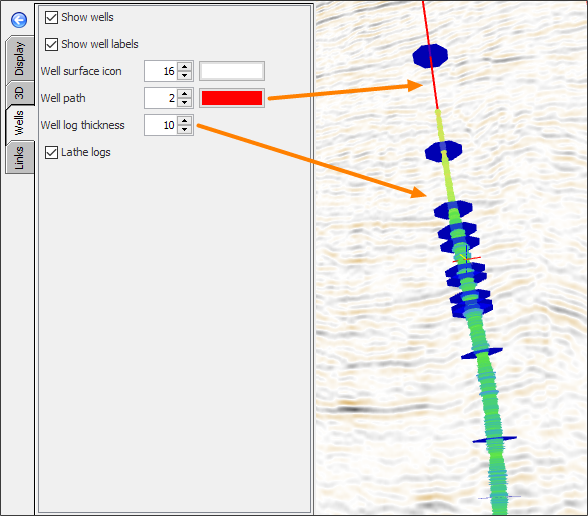 Well path, thickness and colour: Adjust the line thickness and colour of the well path. 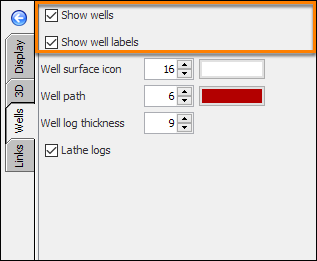 Well log thickness: Adjust the displayed width of the well logs. Lathe logs: Show wells as sculpted cylinders, with the diameter varying according to the values of the displayed log curve. 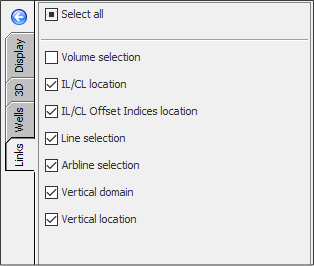 Enable check boxes to link the 3D view to other views. Views with links enabled will share the same line, volume, domain or position. When one view updates, any linked views will change to follow. See the Linking Multiple Views page.